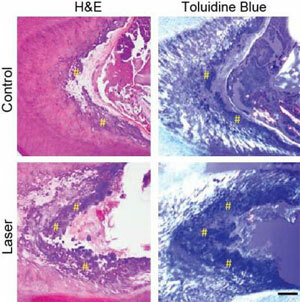 A new low-light laser technique has shown the potential to regrow tooth cells. A team led by Harvard University has discovered that low-power light can prompt stem cells to regenerate tissue inside the body. This shows promise for regenerative medicine, specifically restorative dentistry. In their study, the researchers drilled holes in rodent subjects’ molars and illuminated the tooth pulp, which contains dental stem cells, with a low-power laser. Temporary caps were then applied and left in place for 12 weeks. The yellow hashtags sit atop the newly-formed tertiary dentin. There is more tertiary dentin in the laser-treated teeth than in the control. Courtesy of the Wyss Institute and SEAS. During that time, this process triggered the stem cells to form dentin — the bone-like tissue that makes up the bulk of teeth. Existing techniques require the removal of stem cells from the body and their subsequent manipulation in a lab before they are returned to the body. 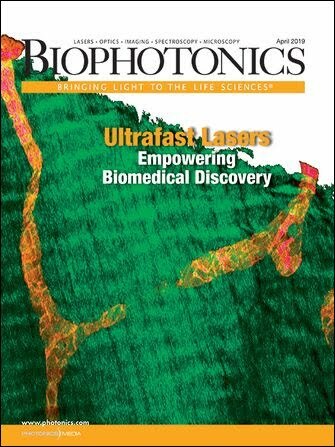 The clinical effects of low-power lasers have historically been too subtle and inconsistent, researchers said, but the new approach is simpler and paves the way for controlled treatment protocols. Also part of the study was a series of culture-based experiments to determine the precise molecular mechanism responsible for the regenerative effects caused by the laser treatment. The researchers found that a regulatory cell protein — transforming growth factor beta-1 (TGF-β1) — was key in triggering the dental stem cells to grow into dentin. This new method could also benefit other areas of medicine, such as healing wounds and regenerating bone. “The scientific community is actively exploring a host of approaches to using stem cells for tissue regeneration efforts,” said Dr. Don Ingber, founding director of the Wyss Institute. The work has been a collaboration between SEAS, the Harvard School of Dental Medicine, Leder Human Biology and Translational Medicine, National Institute of Dental and Craniofacial Research (NIDCR), National Institutes of Health (NIH), Wellman Center for Photomedicine at Massachusetts General Hospital, Harvard Medical School's dermatology department, Harvard/MIT Division of Health Science and Technology, Boston Children's Hospital and New York University School of Medicine. It was funded by the Wyss Institute, Harvard Presidential Scholarship, Harvard Catalyst, Harvard Clinical and Translational Science Center, NIDCR and NIH. The research is published in Science Translational Medicine (doi: 10.1126/scitranslmed.3008234). For more information, visit www.harvard.edu.